Brusco 125 - Keeway Q.J. Think of the Brusco 125 as the slightly younger brother to the Hyperbrusco 175 – but not too much younger! 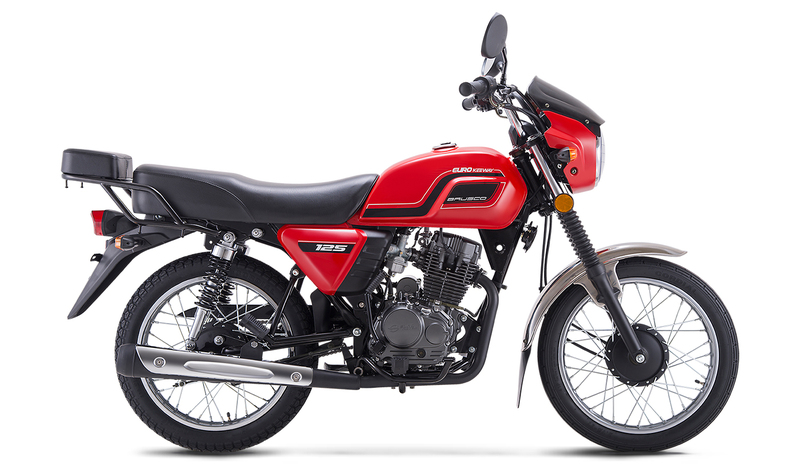 Even though it has 50cc less engine displacement, the Brusco 125 is a hard worker, and one that can go all day on very little fuel. Powered by Keeway’s durable air-cooled 124cc four-stroke single, the Brusco 125 pumps out plenty of easily controllable power for the farm or job site, or for commuting duty around town or even a weekend trek into the country. Like the Hyperbrusco 175, the Brusco 125 is anchored by a sturdy steel frame and capable componentry, including a traditional telescopic fork and dual shocks for a controlled and comfy ride, durable drum brakes front and rear, a large, comfortable saddle and roomy riding position, wide-set mirrors for a clear view to the rear, and both electric and kick starting. The Brusco 125 might be smaller than its bigger brother, but when it comes to functionality and durability, it’s as good as they come. The Brusco 125’s air-cooled, single-overhead-cam four-stroke engine is both reliable and powerful, and pumps out plenty of smooth, usable power – ideal for long work days or quick city trips. A traditional telescopic fork and durable twin shocks provide plenty of comfort and chassis control – the perfect combination for a workingman’s motorcycle. Lightweight and strong wire spoke wheels are fitted to both ends of the Brusco 125, while proven drum brakes front and rear provide strong, confident braking. A sit-up riding position with plenty of seat-to-peg distance and a well-shaped handlebar ensure plenty of riding comfort for all-day rides. Wide mirrors allow a great rear view.